Stems: Erect, sometimes bushy, glandular, spreading- to long-hairy. Leaves: Alternate, simple, upper sessile and clasping, lower on stalks, oblong or ovate, up to 4 inches long, 1/2 to 2 inches wide; surfaces rough or hairy; margins toothed or nearly entire; middle and upper leaves progressively reduced in size. Inflorescences: Loose, corymb-like cluster of numerous heads; involcural bracts overlapping in 4-6 series, short-hairy, usually glandular. 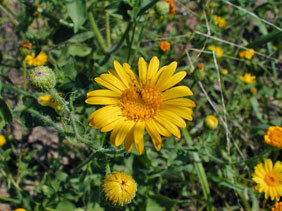 Flowers: Conspicuous, 1/2 to 3/4 inch wide; ray florets 20-40, yellow; ligule about 1/5 inch long; disk florets yellow. Fruits: Achene of ray flowers triangular, thick, mostly glaborus, pappus absent; achenes of disk flowers flattened, hairy, pappus double, outer row of short scales, inner numerous hair-like bristles. Habitat: Open disturbed sites, prairies, open woods, and roadsides; dry sandy or rocky soils. Distribution: Principally in west 2/3 of Kansas, but also to the east border in the Kansas River system. Forage Value: Livestock will not graze camphor weed. Comments: The foliage has a camphor-like aroma.